Dropbox’s road to a refined, scalable illustration system that’s in use today has been long and bumpy. It started with an unconventional move: the company started using drawings created by one of their employees, Jon Ying (who, incidentally, didn’t consider himself an illustrator), when communicating with users. 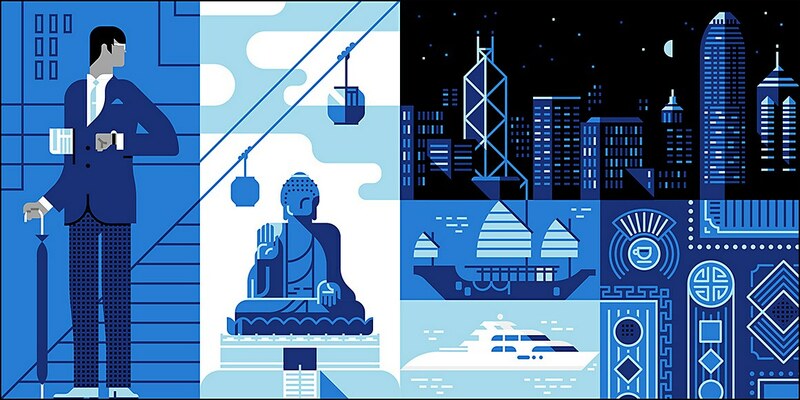 Inspired by a multitude of positive responses, Dropbox continued to experiment with various illustration styles, pioneering the use of drawings not only in marketing communications but in the product itself as well. 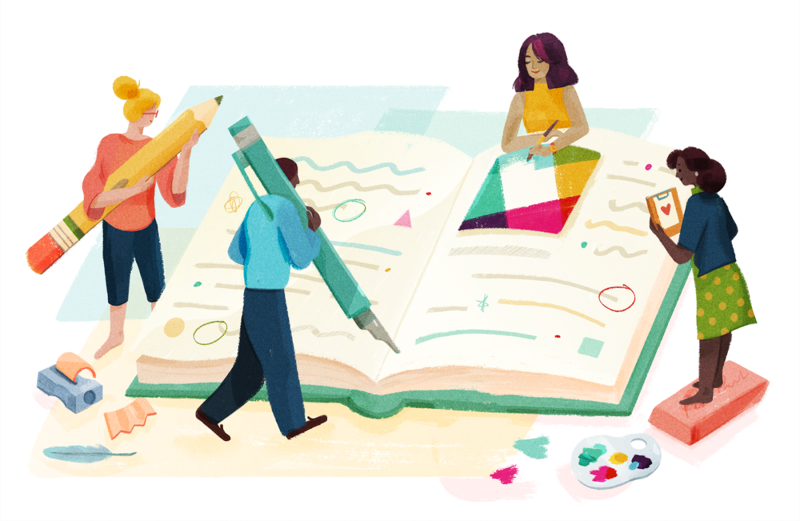 As the company and the brand/design team continued to grow, the illustration system evolved with them. Many risks had to be taken and numerous battles had to be fought in order to prove the value of illustration to the ever-changing managerial staff of a growing start-up. Not doing exactly what was expected of a tech company and experimenting instead, paid off time and time again. A certain piece by Zach Graham, which is actually one of my favourite works of his, is believed by some to have saved the company millions of dollars through discouraging existing PRO users from downgrading to a free plan. 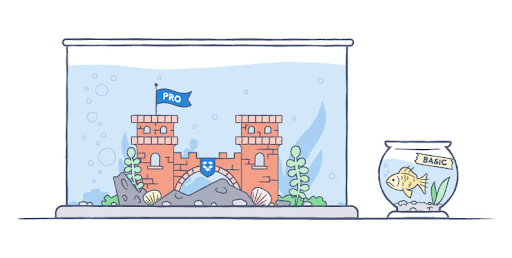 Users who have taken the first step to downgrade were presented with an illustration of a tiny fishbowl placed next to a spacious aquarium. This is a great example of emotionally-charged imagery; it prompts you to consider how miserable the life of a pet confined to a cramped space must be, compared to the life of a castle-owning boss fish, swimming freely in a big aquarium. No mention of files, folders, or storage space, and yet we all get the gist. It seems not only have the Dropbox stakeholders been convinced of the power of illustration, but the entire tech world is now sold on the idea too. 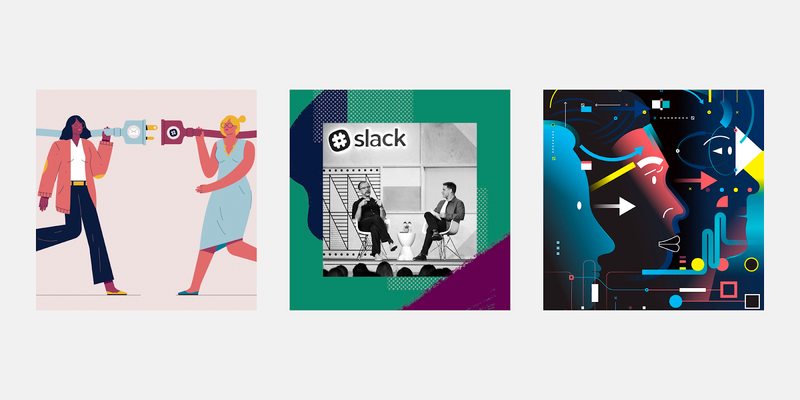 Uber’s unified illustration system spans from the gorgeous, animated in-app badges you might have noticed when complimenting your driver after a ride to compelling ad campaigns displayed on billboards all over the world. The company’s most recent rebrand, launched in September 2018, lists illustration as one of nine pillars making up Uber’s brand system. 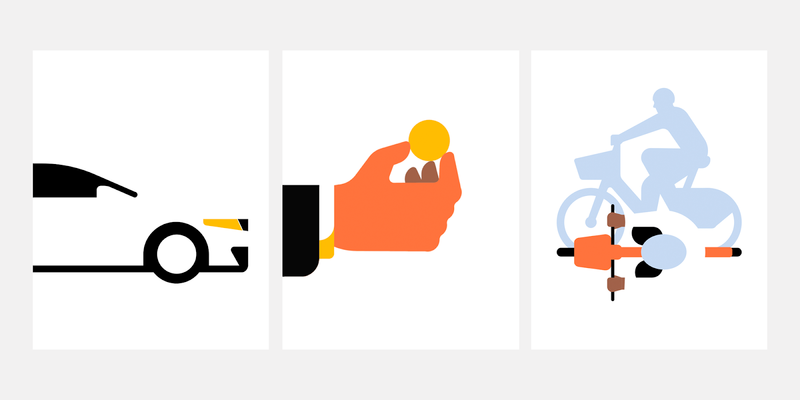 Streamlined shapes, simple lines, and a limited colour palette make the illustrations easy to understand at a glance. So there we have it, a corporate illustration system that’s governed by rules similar to those of fables and children’s stories. Communicating through emotions once used to be reserved for private conversations only, but now it’s a rapidly growing practice for brands to appropriate such language. Companies like Uber employ this and various supplementary techniques to appeal to their customers by speaking to them on a level as personal as possible. 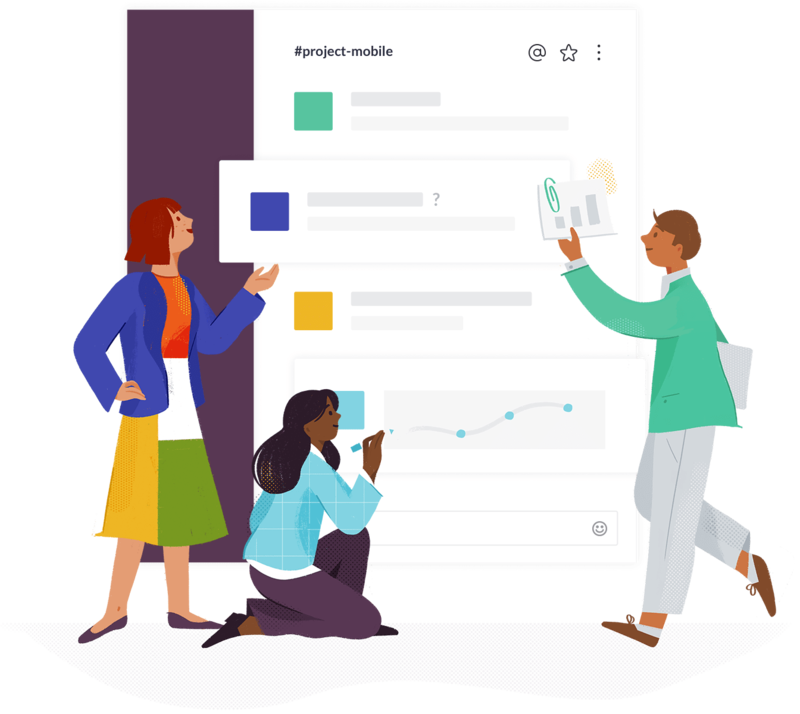 Slack is a collaboration platform that needs no introduction – this brilliant tool has completely transformed the way millions of people work and communicate with team members and clients. The company’s marketing pages have been redesigned latterly; many of them now prominently feature stunning illustrations by Alice Lee. The visuals seem well thought-out, and the characters at work are quite diverse, which contributes to the artworks’ overall appeal. 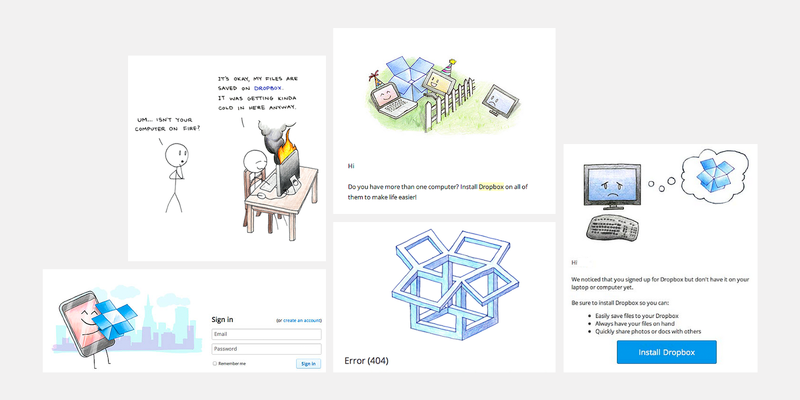 Slack’s blog, Several People Are Typing, is also bursting with illustrations. Interestingly, they’re done in various styles, and yet somehow everything goes together really well. 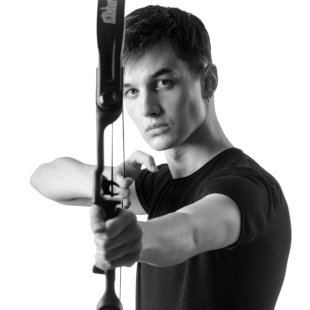 If photographs are used, they are engaging and feel personal – often because they’re enriched with illustrated elements. And to think that they could’ve been boring stock photos of coffee mugs and notebooks. "People do not buy goods & services. They buy relations, stories & magic." And such emotion-enticing, conversion-sparking stories – sprinkled with magic – are best told through illustrations. They help simplify complex messages and allow for communication between companies and consumers to feel deeper and more personal. A cleverly placed witty artwork, be it a hand-drawn icon or a smiley mascot character, has the power to make a laborious task seem easier to accomplish or an “unsubscribe” button almost impossible to click. Did you know we have in-house illustrators at our clients’ disposal at Netguru? We only hire best-in-class talent, so you can be sure your illustration needs will be handled by top professionals.